What the index annuity lets you do is benefit in the up periods without sharing in the losses. The worst thing that can happen, from a market-risk point of view, with an index annuity is that you don’t lose money – you can never lose principal or credited interest if the index declines. ​A score of years ago you could say that banks earned their money by making loans and that insurance companies made their money by primarily buying bonds, but only half of that is still true. The change is that due to the securitization of debt - a topic for another lengthy discussion - many banks own few direct loans, but rather own lots of bonds, possibly some preferred stocks, and perhaps some real estate. Conversely, the bulk of insurance company holdings are still bonds. They may own a smattering of direct loans, possibly some preferred stocks, and perhaps some real estate, but by and large insurance companies buy bonds because of the predictability of the income. If you look back over time, the stock market has gone up many more years than it has gone down, but when it does go down it can hurt, sometimes a lot! 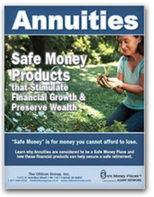 Fixed annuities provide a minimum guaranteed interest rate. If the insurance company believes it can pay extra interest from their general account, above and beyond its minimum guarantee, it uses the extra interest to link the earning of interest to the performance of an external index for the period. The major difference between a fixed rate annuity and a fixed index annuity is in the crediting of excess interest above the minimum guarantee. ​How Do Fixed Index Annuities Pay Interest? It might be easier if we compare how an index annuity pays interest with the way a bank pays interest. As you know, when you place your money with the bank they invest this money, earn a return, and, after subtracting their costs, pay you net interest rate for a stated period. Your principal does not fluctuate, but the interest you receive can and usually does fluctuate from period to period. Furthermore, this fluctuation can be extreme. But in any case, this sums up how a CD works. An index annuity operates the same way, except that you place your money with an insurance company instead of a bank. When you place your money with the insurance company they invest this money, earn a return, and subtract their costs. The difference between the CD and the index annuity is that the amount of interest paid is linked to the movement of an external index. When the index goes up, the amount of interest earned increases. However, because this is a safe money place and not an investment, the index annuity does not share in any decreases of the index. Though it’s not really a “catch,” because it costs insurance companies to provide this valuable protection, you probably are not going to get all of the upside. 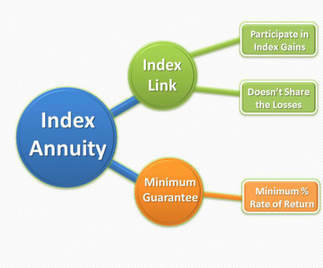 All index annuities guarantee the rate of participation in the index annuity for a full year. Typically, an index annuity will guarantee index participation for one year at a time and declare the new index participation on the policy anniversary for the next year. Some index annuities lock-in all of the initial participation elements for two years, three years, or even for the entire penalty period of the annuity. The amount of index participation may be expressed in many different ways. Some index annuities state you will receive a stated percentage of any calculated index gains over the periods, others may give you all the calculated index gain up to a certain interest ceiling or cap, others may use averaging or other variations. No index-link method is good or bad and any method can be the winner in a given period. The key is understanding how it works. If you cannot understand the method, do not get the annuity. ​How Much Interest Do Fixed Annuities Earn? The index annuity offers an alternative to concerns over rising interest rates by linking interest to changes in an equity index. An index annuity benefits in increases calculated for the index over a period, but even if the index goes down you can never lose principal or previously credited interest. The highest index annuity interest rate credited for one year was over 40%. In 2002 and 2008 the major stock market indices went down and index annuities linked to these indices credited 0% for the year, but no previous interest was lost. Index annuities are designed to provide a longterm return somewhere between stock market vehicles and other safe money places – always protecting principal and credited interest from market risk - and they have performed as intended. A fixed annuity guarantees to credit a minimum yield and that is what makes a fixed annuity a fixed annuity instead of an investment. In the case of an index annuity the minimum guarantee is usually structured to simply protect the premium and perhaps pay back a few extra bucks, rather than crediting a minimum interest rate each year. For example, an index annuity might guarantee to return a minimum of $1.10 for each original $1 of premium at the end of seven years. If the index does not produce at least this minimum index-linked return the insurance company will retroactively go back credit enough interest to reach $1.10. “Chronic Illness, Terminal Illness, Confinement Waivers” are riders that provide important benefits, such as: complete liquidity after a certain period of confinement, and increased payouts in the event the annuitant experiences some degree of incapacity that prohibits him from operating independently. Other riders for inflation and death benefit enhancement are also available. Please make sure to look at each company’s riders as they differ from company to company. Bottom line: an index annuity with an income rider and a confinement rider can make retirement more enjoyable with a lot less stress. ​Want to See what a Fixed Index Annuity Can Do For You? Fixed index annuities link the interest paid to the performance of an index and state what your participation in the index will be. How Do Fixed Index Annuities Pay Interest? How Much Interest Do Fixed Annuities Earn? Want to See what a Fixed Index Annuity Can Do For You?